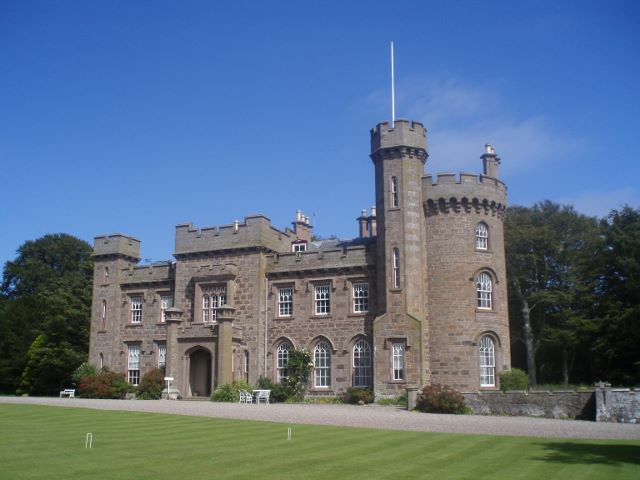 Dunninald was built in 1824 by the architect James Gillespie Graham in the Gothic Revival style. Guided tours of the castle explain the history of the house, the collections of furniture, paintings and displays of fine needlework photographs and memorabilia, examples of fine plasterwork and trompe l'oeil can also be seen. Tours take approximately 40 minutes and start on the hour and half hour. Snowdrops in Spring and bluebells in May carpet the woods and wild garden. At its best in July, a highlight of Dunninald is the walled garden. Set a short walk from the house at then end of a beech avenue, the walled garden is south facing with a curved wall, and planted with traditional mixed borders, vegetables, soft fruits, fruit trees and a greenhouse. Boddin Lime Kilns from the north. Dunninald has a history of at least a thousand years. The name is derived from the gaelic, dun a castle and ard, a high place. The first Dunninald was on the cliff high above the North Sea, so the name is a good description of the original site. The origin of its colloquial name, Black Jack, is lost. A second house was built about 1590, to replace the old tower fortalice. This was some four hundred yards inland and was at the foot of the present-day beech avenue, next to the walled garden. By 1811 the second house was some 230 years old and the new owner, Peter Arkley, commissioned James Gillespie Graham to built a new house. This was designed in the gothic revival style, building started in 1819 and the house was completed in 1824. James Gillespie Graham specialised in the gothic revival style and built many houses and churches around Scotland. He designed the Glenfinnan Monument in 1815, and one of his students was Augustus Pugin, who famously worked on the Houses of Parliament at Westminster, London. Other notable works include St Andrews Cathedral in Glasgow and St Mary's Cathedral in Edinburgh. He designed the church at the top of the Royal Mile in Edinburgh, now known as The Hub. Two of his major country house properties are now ruins: Armadale Castle on Skye and Cambusnethan Priory near Glasgow. View map of Gillespie Graham works in Scotland. Dunninald has hardly been altered in the years since it was built, which is the main reason why it is held in such high regard. The house has long been associated with the sea, and is only half a mile from the site of the first Dunninald (Black Jack) and the old lime kiln at the Boddin promontory. From the Boddin can be seen the broad sweep of Lunan Bay, with the ruins of Red Castle at its centre, and the Bell Rock Lighthouse, 15 miles out to sea. In the days of Black Jack, salmon were caught in traps on the rocks below the castle. Now bag-nets may be seen in the water between the months of June and August.